On any whitewater rafting trip the rafters always are concerned about the temperature of the water. They want to know what to wear and bring on their rafting trip and definitely want to know if the water will be COLD – no one loves cold water. It is a common misconception that big whitewater always occur in cold water. At Crab Apple Whitewater we are fortunate that all of our rafting trips take place on dam controlled rivers. Dam controlled rivers often run warmer than free flow rivers because water is stored in reservoirs and warms before flowing through the next impoundment. 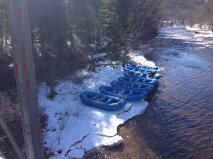 In Massachusetts, Crab Apple Whitewater rafts multiple sections of the Deerfield River. Each trip is dependent on scheduled hydro-electric releases from a dam. The water in the spring is a combination of spring rain and winter snow melt. As you can imagine, the water is quite cold (temps in the 40’s). The Fife Brook Dam controls the most popular section for whitewater rafting on the Deerfield River. The water upstream of the dam is held in a relatively shallow and small reservoir which only holds the water for a short period of time before passing it downstream. It does not sit long enough to really warm up from the sun and never runs at very warm temperatures. By late spring/early summer the water gradually warms through the 50’s and will approach 60 by the time the heat of the summer hits. In July and August the water on the Fife Brook stretch will climb above 60 and during a warm summer will top out in the upper 60’s where it flows out below the Fife Brook Dam. Upstream of the Fife Brook Section is the Monroe Bridge dam on Deerfield River. Featuring technical maneuvers and big waves through Class 3 and 4 whitewater, it is the biggest white water in southern New England. The water flowing over the Monroe Bridge Dam never really warms up – temps in the upper 50s to low 60s in the heat of the summer is the peak. The white water is so much fun that you won’t even notice the chilly water temps – a splash of cool water on a hot summer day feels so good! In Maine, Crab Apple Whitewater Rafting is fortunate that the water flows off the top of the large lakes sitting upstream of the dams structures that feed the Kennebec and Dead rivers. With a top fed system, water is continually heated by the sun through the rafting season and warm quickly to surprisingly comfortable temperatures. In the spring, the white water on Maine rafting trips remains in the low 40’s, but once the sun and the air get warm the river water heats up quickly. Warming through the 50’s in May, the rivers will climb into the 60’s in June and by July the water will be at least 70 degrees. In the heat of the summer the whitewater will soar into the 70’s! The water will hold near its peak through August and into September. As Fall hits in New England and the days are shorter and nights run cool, the water temps drop and by October we’ll be riding rapids in the 50’s again. In general, we are blessed on our Maine whitewater rafting trips to have very comfortable water temps throughout our peak rafting season. Please check our other blogs for some ideas on what to wear on our whitewater rafting trips. If you choose a spring or fall trip in cooler water, dress accordingly and you’ll often have some of the most exciting rides of the season.